You were expecting me to do a neon paint treatment werentcha? Well I'm not ruling that out just yet, but when I set this goal in mind I actually really wanted to DIY a neon sign. I started researching my options and I found out there are actual kits for the stuff! I decided to order this super affordable one from Urban Outfitters. The kit instruction were very easy to follow and basically just involved lashing the neon rope to wire which I twisted into the word "Mutt" for obvious reasons. It does have a very subtle hum when it's turned on (like the kind you can only hear if you're under 30 years) so it's a good thing I'm creeping up on the big 3-0. HA! 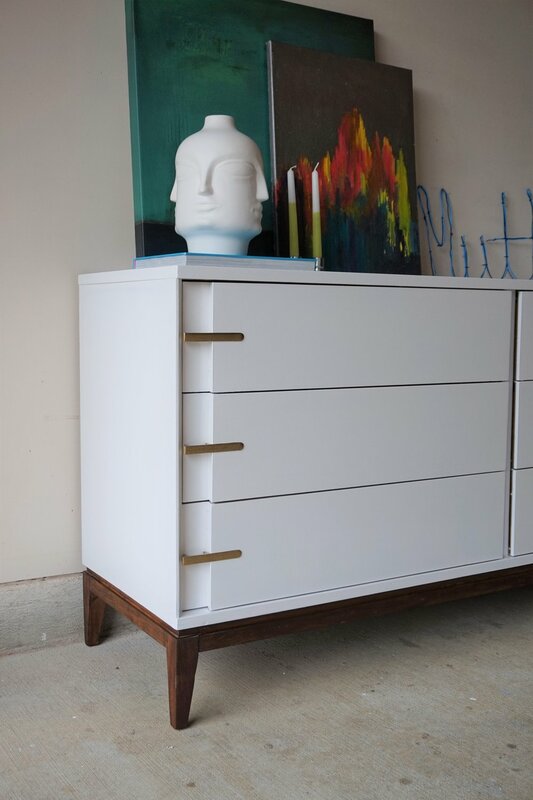 Switch gears with me really quick and let's talk about the other new kid in the room: this white and walnut dresser. The drawer fronts were in great shape so I really did debate highlighting the wood grain, but I was seeing a very specific vision for it in my mind so everything but the legs got painted a glassy white. The original dresser did have some damage to fix - the big undertaking being the mystery gnaw marks in the left front leg. Normally, I would putty that in and slap on some paint but I really reeeeeeeeally wanted to keep the base wood so I had to hand paint the filler with some acrylic paint to match the rest of the wood grain in the leg. I love the contrast of the dark legs against the white enameled body - a luxury finish! 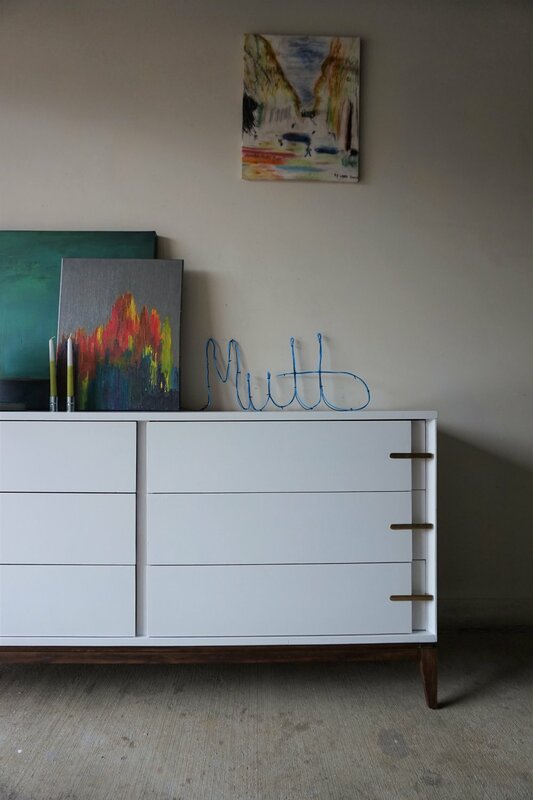 You might actually recognize the unusual pulls on this piece from another StyleMutt refinishing project. That's because this long-and-low is actually from the same line as that tallboy I did last spring. Just like I did with that piece, I kept the original brass pulls as is 'cuz I mean, they are just. that. yummy. As for the styling, I wanted to punctuate the bright neon sign with some bright-colored art like that enchanting Laura Gunn gallery-wrapped canvas print (cue all the heart eyes!). Accenting with my usual quirky décor also seemed like a natural fit. 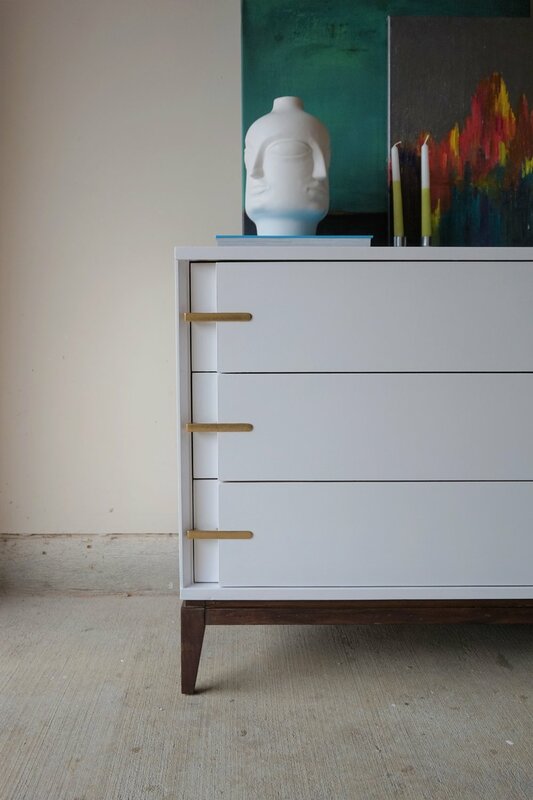 And if you're looking for a beautiful dresser to anchor your space, drop me a line (aka just shoot me an email) to discuss our pick-up or shipping options.